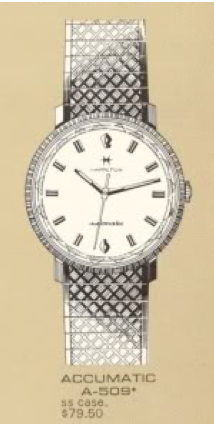 When Hamilton ceased production of US-made watches in 1969 there were about 200 watches in the model line up. That's excluding any of the non-catalogued models made by the Awards Division. Compare that to the 32 models offered in 1940. 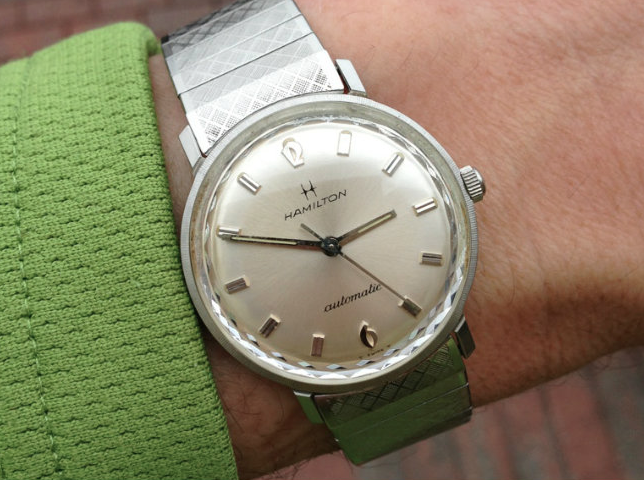 Of course, by the 1960's Hamilton offered watches with manual, automatic or electric movements, as well as day & date models - so that's a lot of additional options that did not exist in 1940. One of the watches introduced in 1968 was the Accumatic A-509. It was also offered in 1969. Information is scarce regarding the model lineup after that so I don't know if the A-509 was offered in 1970 or later. I don't believe so. The A-509 came in a stainless steel case. All 5XX series models come in a stainless case. The bezel has very fine reeding along the circumference and the crystal has a faceted diamond edge inside. Under the dial is a 17 jewel Hamilton 694A movement. This Swiss made movement was produced by ETA and is identical to the ETA 2472 grade but with Hamilton markings. I recently purchased an Accumatic A-509 and it happened to come with the original JB Champion bracelet. The diamond-faceted crystal is a very nice detail but a challenge to replace. Mine has a crack along the side of it that has collected some dirt. It would look better if it was replaced but this watch would lose something with just a plain crystal. Hi. I have a diamond gold and platinum Hamilton watch case. I am wanting a watch that would work with my vintage case. Everyone I have conacted wants to know the caliber. I need help please. The calilber is the movement that goes into the case. You'd also need a dial in the size and shape that fits the case as well. If you email me photos of the case and the inside of the case back I might be able to help identify the model. My email address comes up when you click the "Contact me by Clicking Here" in the upper right, above my photo.